Another day, another salvo of parliamentary Brexit votes. Our so-called lawmakers are making a complete hash of implementing the UK’s 2016 referendum Leave verdict. For anyone who’s been watching this political fiasco from the start, that’s no great surprise. While Brexit may seem top of the country’s current agenda, though, something equally serious is happening in the background. Last Friday I spotlighted one aspect of it. Brexit confusion is grabbing the headlines, but it’s not freaking out financial markets. A week ago, I noted that the yield on UK 10-year gilts had dropped to just 1.07%. It’s since declined to just above 1%. To repeat: by historic standards, that’s an almost negligible borrowing cost, helped in part by improved government finances. But the main underlying reason is concern that economic growth could slow further. This would lower demand for money, thus making it cheaper. And here’s where the extra element I mentioned earlier comes into play. It hasn’t happened yet in the UK. But in the US, the yield curve in the process of ‘inverting’. The yield curve measures the gap between yields paid on shorter- and longer-term government debt. The latter are usually higher, reflecting the extra compensation needed by investors for locking away their money over greater timeframes. But this can change. If investors begin to anticipate weaker growth than they’d earlier expected, they’ll accept lower longer-run yields than before. So the yield curve will flatten. If shorter-run yields become higher than those on longer-term bonds, the curve is said to ‘invert’. That’s the early-warning signal for shrinking GDP: all of the last seven US recessions have been preceded by an inverted yield curve. 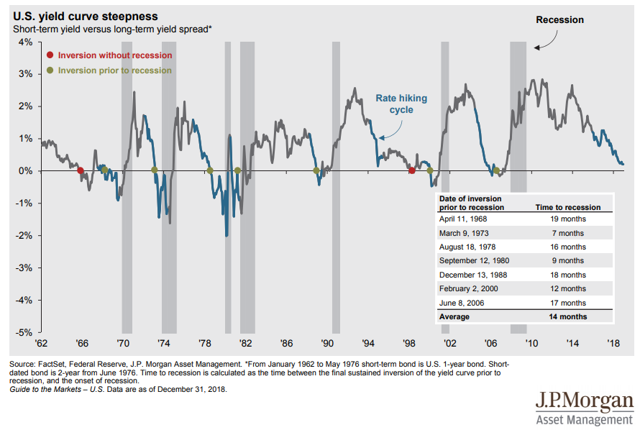 As this chart (for which many thanks to JPMorgan Asset Management) spanning more than 55 years shows, recessions tend to follow inverted yield curves by around 14 months. Please note that this only contains data up to end-December 2018, so it doesn’t display the latest inversion. Further, you can see that the real damage to GDP actually occurs when the curve has started steepening again. One expression often bandied around nowadays is “it’s different this time”. To be fair, the backdrop to the inverted yield curve does contain distortions that weren’t present in previous examples. QE – quantitative easing, i.e. debt monetisation – has caused a quantum reduction in government bond yields. It’s hard to know exactly how this has influenced the shape of the curve. Further, the sheer scale of America’s state debt – now $22 trillion and counting – could make investors less willing to buy US Treasuries at current levels. But the flattening yield curve is matched by the gloomy tone emerging from other gauges such as consumer confidence expectations compared to current conditions. Indeed, America’s Conference Board composite leading indicator – which includes the yield curve as well as other measures such as manufacturing orders, business surveys, jobless claims and the stock market – has a great track record. 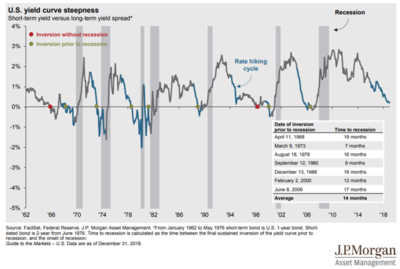 It’s fallen prior to every recession over the past 50 years, peaking eight months before the 1969 and 1981 examples and 21 months pre-the 2007 crisis, notes Capital Economics. The leading indicator is now clearly heading south. “There is mounting evidence that the cumulative increase in interest rates is hitting demand in rate-sensitive sectors of the economy, notably housing, autos, and more recently business investment, all of which tend to lead overall GDP”, says Michael Pearce at Capital Economics. “It has also fed through to weaker demand for bank loans”. Further, an inverted yield curve may increase the chances of a self-fulfilling downturn in confidence and activity. “The latest Survey of Senior Loan Officers showed that in response to a moderate inversion of the yield curve, around 40% of banks would tighten standards on commercial and industrial loans”, says Pearce. “That in turn reflects bankers’ concerns that an inverted yield curve would be followed by deterioration in economic conditions and worsening of credit quality”. No surprise there. As the old adage goes, bankers will give you an umbrella when it’s sunny but will take it away from you when it starts raining. “There’s no sophisticated economic or financial market theory that explains the predictive reliability of a yield curve”, says Societe Generale strategist Albert Edwards. But “with the US housing market clearly softening rapidly, there is good evidence that rent inflation in the US is set to plunge and take the dominant ‘shelter component’ of core CPI [consumer price index] inflation substantially lower”. “Back in the early 1990s, a decline in new home inflation saw CPI rent inflation slide from above 4% to 2%. A similar outcome now would see core CPI move closer to 1% than the current 2% – like throwing petrol onto a government bond market that’s already on fire”. Put another way, falling inflation implies that America’s inversion process could have a long way to go. That could be bad news for US stocks. And as these drive equities all around the world, we can expect some fallout in London as well. As I discussed in last week’s UK Uncensored, MMT could be touted by many politicians (promise: no more rants about them today!) as the answer to the world’s economic issues. In fact it could cause several problems. But along with lower bond yields and an inverted curve it would boost one particular investment. To find out about this, you can look at the latest research from Strategic Intelligence here. And we’d love to see your comments about this article: please email us on ukuncensored@agora.co.uk.